Polls are open until Tuesday, April 22, 2014 at 11:59 PM EST. Enjoy! Special thanks to The Big G for more awesome graphics! And... I have to reset it back to a tie for everyone. We are quite literally opposites on this one. So far Chrono is leading, OoT is leading, LttP is leading, and Melee is leading. But this is all so close and there's only like five votes. This was a tough bracket to cut into. Blame it on the direct and the podcast i'm editing about it but I had to easily pick Melee over Super Metroid despite how great that Metroid is. Edit: You know... I need to change my vote to OoT. I loved SM64 but damn if OoT didn't 'have it all'. Music/Story/Gameplay/Puzzles/Length/Characters/etc. These were some tough choices. Perhaps there should be a losers bracket for the elite 8? Ooh! I like that idea. Lets do a losers bracket for the bottom four! a. Gotta go with Chrono Trigger here. I'm not the biggest fan of the original NES Zelda; it's good, but it's far down my list of favorite Zelda games, so I am not too attached to it. b. Easy vote here. I love Mario 64, but going on 16 years later, Ocarina of Time is still the best game I've ever had the privilege of playing. c. If I could abstain, I would, because I have not played Xenoblade. Still, LttP is an incredible game and a defining entry into the series. 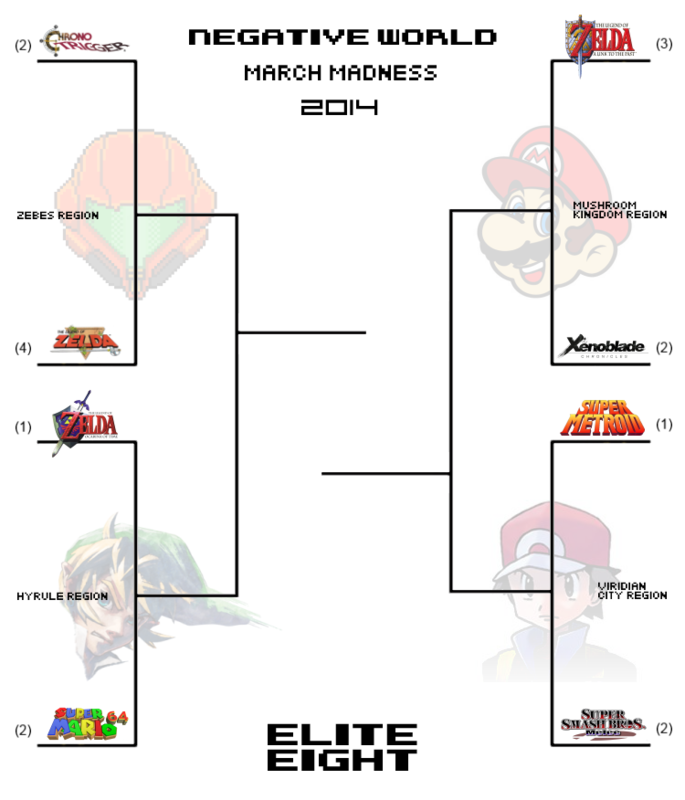 Since it (sadly) beat Metroid Prime, it has earned its place in the Final 4.
d. This was the toughest vote for me. Two things really decided it for me: One is that I prefer Prime, which I would have fought really hard for in this round, to Super. So, being that it is probably my third-favorite Metroid (behind Prime and Echoes), I didn't have as strong of an attachment to it. And the other determining factor is that Melee is the best of the three Smash Bros. games, and of the three, was the one that I spent the most hours playing multi-player with friends. And with Goldeneye (sadly) being bounced early, it's only fitting to have another legendary multiplayer game make it to the semi-finals. Oh boy. The other choices here were (relatively) easy, but it pains me so much voting against Xenoblade, even if it's a result of me voting for A Link to the Past. I say you let me vote for both and scrap Super Metroid and Super Smash Bros. Melee. When all is said and done, will we get a nice graphic of how the whole tourney went? Love Zelda, but its no Chrono Trigger. Ocarina squashes Mario 64, and Link to the Past has a much stronger hold on me than Xenoblade -- I haven't even beaten it, or played it in like 2 years. Now, this last one. Metroids have been bugging me lately. Super Metroid speedruns make my stomach turn, and I'm officially sick of the Prime games, I think, even if they're pretty good for the most part. ..I'm just gonna go with Smash Bros. HMM. I like Link to that Past, but Xenoblade is one of a kind.